There are a lot of good scenes in Flash #6, but Williamson and Di Giandomenico have crafted a painful issue. Right at the outset we watch Godspeed drag a person to his death at super-speed, and that is not even the worst thing that takes place in this story. A lot of the pain is emotional, though. Barry Allen is torturing himself over Meena’s apparent death at the hands of Godspeed in the previous issue, and the other speedsters of Central City are terrified for their lives, pleading with the Flash to remove their powers. There are some excellent conversations between Barry and his “sidekick,” August, and Wally West gets a great freak out scene when he finds out Meena has vanished. 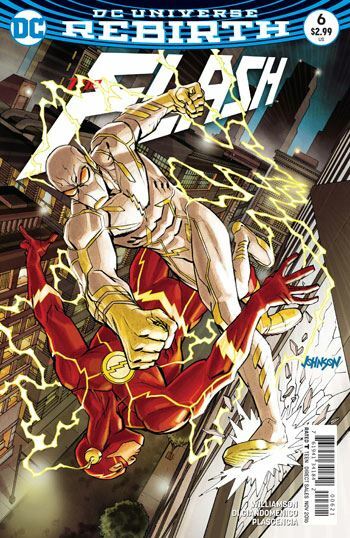 Wally runs away from the scene, and the Flash finally notices that Wally West has gained powers. This leads to a nice bit of musing on his part, about the improbability of two Wally Wests in his life gaining super speed. Is Meena dead? Most of the characters believe that she is. But Barry notes that her costume remained intact, and he compares her disappearance to his during the Crisis on Infinite Earths, although he cannot see how such a thing could have happened with her. It’s a good tease, and one of the only bright spots in the issue. What is really shocking, and heart breaking, is the revelation of Godspeed’s identity. I never do spoilers, and I am being careful not to reveal too much. But it’s a worthy revelation, one that Williamson spent time building up, so it pays off very effectively.